This book is an incredibly candid and honest portrayal of running startups, and in particular, taking on the incredibly challenging role as CEO. There’s a whole section devoted to ‘the struggle’ one can expect to dace, that exposes the brutal reality of launching and managing a startup, and being the CEO of an organisation. 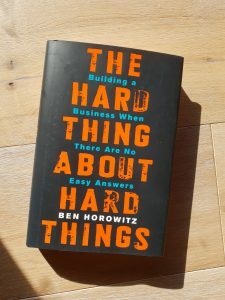 Horowitz details the range of emotions experienced, most of which you’ll never read in generic ‘how to’ business books. Is it ever ok to poach employees from a friends company?